I am vegan because I care about animals, myself and the environment. I was vegetarian for over 20 years and went vegan over a year ago. BEST decision I ever made! I would love to win this….especially since I can’t find issues where I live. After being vegetarian for so many years, I thought becoming vegan would be too hard on my family. But after I read into it, I realized that the animal was probably happier to be killed than living the life of torture and suffering it was forced to. As an extreme animal lover, it was an easy decision to cut animal bi-products out of my life, and the way I live has never been the same. Being vegan is a huge part of me now, and I have been able to help others see the truth behind the food industry by being so. After learning the benefits of a vegan lifestyle on impact on the environment, the body, and the world we live around us, there is no ounce of my being that craves any animal bi-product infested food. It just seems like the logical choice for me now. I love it. Always Love. Always Vegan. I became a vegan last November after learning about all the healthy benefits from several different documentaries. 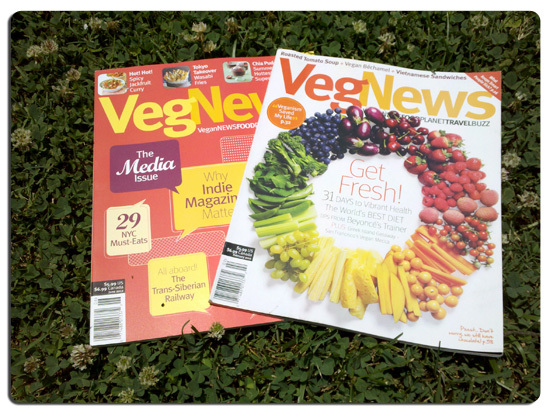 I’m still learning new things everyday and always end up doing to the bookstore to read VegNews. Being a college student, reading the magazine for free is the only thing I can afford! Being 6 monthss, I don’t know how I was every anything else. I love this vegan life. I’m vegan because, after studying nutrition for 8 years, I learned of the dangers lurking in meat and dairy products, and I truly believe the human body functions more efficiently on a plant-based diet. The hormones and toxins and impurities in steak, eggs, and milk are not things I wish to enter my body. I was vegan in college and some years thereafter, and then slowly got away from it. Now having middle-age health problems (doctor-mistake-induced) and feeling like a vegan diet is the best thing for me and for the planet! For the goodness of human life, and for mother earth! I’m a vegetarian because I deserve to be healthy and animals deserve to be treated kindly. Honestly, I became vegan because I wanted a challenge. My best friend had been vegan for 3 years, and I knew there were a lot of health and environmental benefits, as well as some compelling ethical arguments. However, I spent 6 months transitioning to a vegan diet before listening to or reading any of the ethical arguments. After 2 months as a successful vegan, I read Peter Singer’s “All Animals are Equal”. Now I can say that I am vegan for many reasons: it is what I believe is right for living a compassionate lifestyle, and I know that my own person and the world around me is better for it. I have been vegetarian for a while but most recently became vegan two months ago and so far am loving it. I am a twenty one year old nursing student who is really into running and staying fit and found fueling myself with frutis, vegetables and whole grans is the most efficient and healthful way to allow my body to respond and adapt to all I put it through. Although I know its not the preferred choice for everyone I strongly belive in the benifits of this diet. I vainly started a vegetarian diet after gaining the “happy weight” of marriage. I began researching vegetarianism for nutrition info and stumbled upon the nastiness that is mass farming. I’ve been some type of vegetarian for almost 14 years. I dabble between pescatarian, veg and vegan, but spend most of the time in the vegan range. Btw, what do you think about honey? I’m thinking about becoming a vegan for a variety of reasons. Health benefits for myself and my family, I rarely eat meats or dairy as it is and others. My main concern at this point is that my 3 yr old was diagnosed a week ago with a very rare metabolic disease and eating clean and monitoring his diet is going to be my biggest job EVER, as his life truly depends on it. The more informed I am about our options and diet, the more I can control his while setting an example for him to follow. It’s been a long time coming, but I think it’s time. My story is a little embarrassing, I was at the start of my Morrissey/The Smiths obsession and I thought to myself that if I ever met Morrissey (not likely but a girl can dream) I would have to be vegetarian. The song “Meat is Murder” also drove the point home. I was starting law school and it was the perfect chance to re-make myself in a new setting. I spent all summer before school gradually cutting meat out until the first day of orientation when I was fully vegetarian. Of course the menu at orientation was sloppy joe sandwiches but I managed to put a salad together and never looked back. I eat a plant based diet because it makes me feel great and I believe it is the best way to eat. I’m vegetarian because I think non-sentient beings taste better! Simple. I went vegan because I knew animals did not have to die for me to still eat. When we are gone I hope the future generations will look back at what vegans did and take inspiration from it and due more to stop animal suffering. I am vegan because I feel better when I eat a whole foods, plant based diet. I initially became vegan for this reason, although now I am learning more about where our foods come from and starting to take a stance that is balanced between the ethics of being vegan and the health benefits of being vegan.